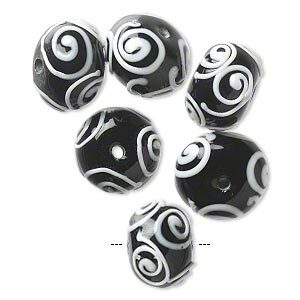 Bead, lampworked glass, opaque white and black, 18x12mm-19x14mm rondelle with swirl design. Sold per pkg of 6. 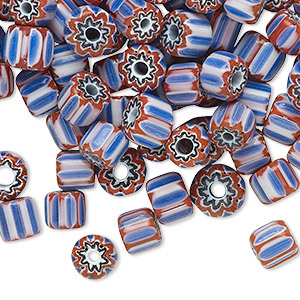 Each lampworked glass bead is created individually by master craftspeople. Sizes, shapes and colors may vary with handcrafted items. 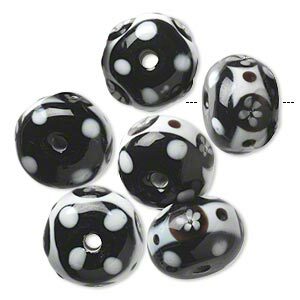 Bead, lampworked glass, opaque white and black, 15x11mm-17x12mm rondelle with flower and dot design. Sold per pkg of 6. 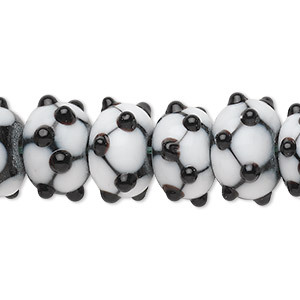 Bead, lampworked glass, opaque white and black, 17x12mm rondelle with flower and dot design. Sold per pkg of 6. 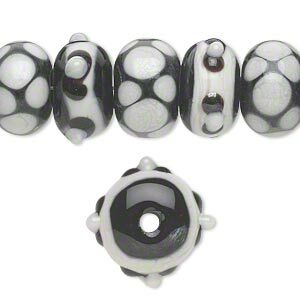 Bead, lampworked glass, black and white, 14x9mm-17x10mm bumpy rondelle with assorted designs. Sold per pkg of 20. 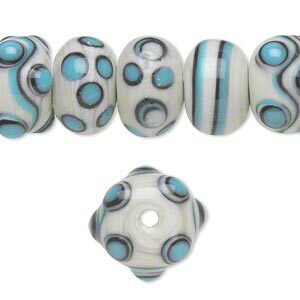 NEW - Bead, lampworked glass, opaque multicolored, 5x4mm-6x5mm rondelle with 0.6-1mm hole. 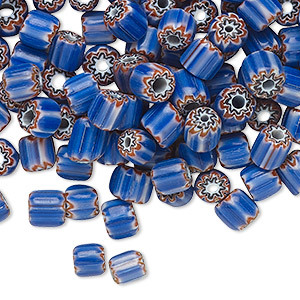 Sold per 1.5-ounce pkg, approximately 150-180 beads. NEW - Bead, lampworked glass, opaque multicolored, 6x5mm-7x5mm rondelle. Sold per 1.5-ounce pkg, approximately 90-110 beads. 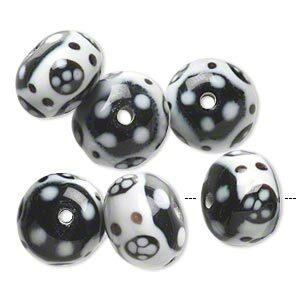 NEW - Bead, millefiori glass, opaque black and white, 5mm-7x5mm rondelle. 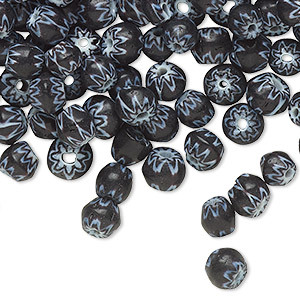 Sold per 1.5-ounce pkg, approximately 160-170 beads. 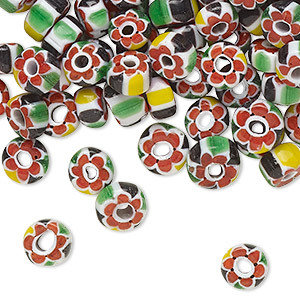 NEW - Bead, millefiori glass, opaque multicolored, 6x3mm-9x5mm rondelle with 1-2mm hole. Sold per 1.5-ounce pkg, approximately 130-140 beads. 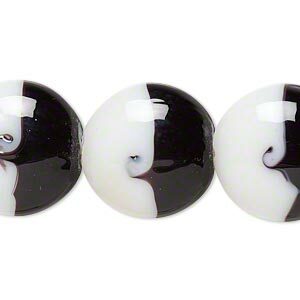 Bead, lampworked glass, black and white, 20mm puffed flat round with swirl. Sold per 16-inch strand.